When making and distributing cosmetic products, it is important to follow marking and labelling regulations. This involves including important information about the manufacture of the items as well as their ingredients. 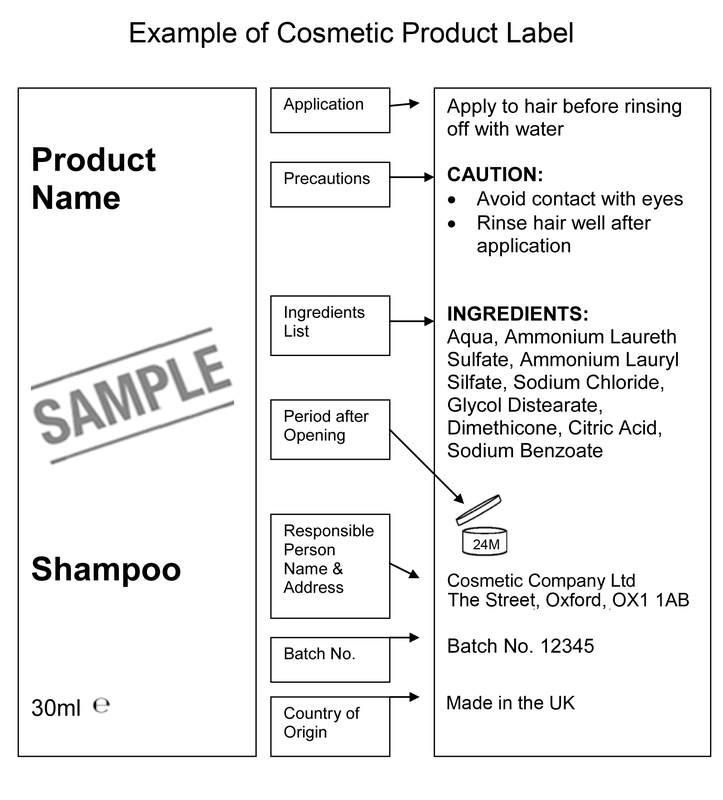 Oxford Biosciences provide labelling guidance and review. Please email safety@oxford.bio for more details about this service. The following are some important labelling regulations to keep in mind when developing cosmetic items for sale. The language of the information shall be determined by the EU Member State where the product is made available to the customer/end user. All packaging needs to include a list of the items’ ingredients used to make the cosmetic items. This piece of the label should include a header titled Ingredients. All of the ingredients should be listed in descending order of their weight. This is identified when the items are added to the products. Impurities in any used raw materials do not need to be listed. Additionally, any items used to prep the products but not in the final item do not need to be listed. Solvents used perfumes are also an exception. Any ingredient with less than 1% concentration can be listed in any order (after, of course, ingredients with 1% or more concentration). Any colouring items can then be listed after the other ingredients. The actual ingredients listed should follow those located in the International Nomenclature of Cosmetic Ingredients (INCI) database. If no name is included, manufacturers should include: the chemical name, CTFA name, European Pharmacopoeia title, International Non-proprietary Name (INN), EINECS ID, or colour index number. 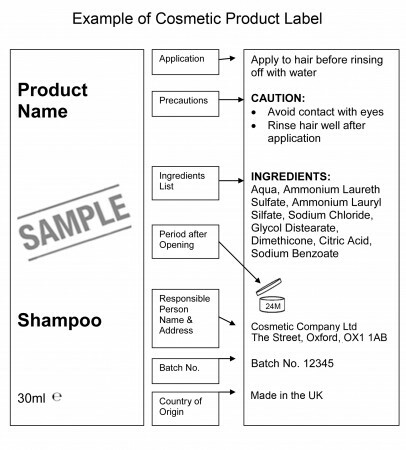 All cosmetic labeling should include the official name of the manufacturer or the EX supplier. Additionally, regulations state that the full address of such groups should be listed on the labels. This could be the registered office address for the manufacturer. Customers should know what they are buying. Thus, regulations state that the function of the product needs to be clearly expressed on the labelling. If the function of the product is not clear from the item’s packaging or its design, then it should be clearly stated. For documentation’s sake, information about the item’s production batch needs to be included. This can mean a code is assigned to the product along with a date, or the company can include more information. It is important that cosmetic products are clearly labelled with Best Before date. For example, after 30 months, an item’s quality may deteriorate. This could mean that the product no longer meets safety regulations and should not be used. Thus, companies need to mark products with a specific Best Before date that states when the product is no longer good to use. The formatting of this date is as follows: Best Before (date). Any information about caring for the product that affects shelf life should be stated on the label. Some items have a shelf life of more than 30 months but will deteriorate quicker if the product is opened. Regulations today have a visual symbol to signal this. This image looks like a jar with its lid open. Any cosmetic product that has a lifespan of less than 30 months must show a “Best before the end of” date. This can be shown using the “egg timer” symbol followed by the date, or the words, which can be abbreviated to BBE or Exp, followed by the date. For products with a lifespan longer than 30 months, cosmetic products must show a “period after opening” time. That is, the time in months when the product will remain in good condition after the consumer has used the product for the first time. A symbol of an open cream jar is usually used instead of words and the time in months can be inside the symbol or alongside it. Here is a copy of the symbol showing a time of 24 months. Additional information about added preservatives and UV filters should be listed on the labelling. This content helps customers make educated decisions about which cosmetic items to invest in. More information about this is listed in Schedules 4,6, and 7 of the Official Cosmetics Labelling Regulations. Also alongside the SPF number there will also be an indication of the type of protection that products give the consumer – i.e. low, medium, high or very high. The most common SPF numbers are shown in the table below. The UVA protection that a sunscreen provides will be evident on the label. It is a legal requirement to state the net contents of a product on the pack; that is, the quantity of product at the time it is filled into the packaging. For cosmetics, it is shown in grams (g) or millilitres (ml) for solids or liquids respectively. The “e” mark must be shown if the product is filled according to the “average fill system” which is defined in weights & measures legislation. The most common symbol seen is the “Green Dot”. This is a trade mark that shows membership of a specific recycling and recovery scheme to deal with the packaging waste of the company’s products and membership fees must be paid to the ‘Green Dot’ scheme. All companies in Europe and the UK have a legal obligation to recycle and recover packaging waste and the usual way of doing it is to pay a specialist company to do the work on the company’s behalf. In the UK, there are a number of competing recovery and recycling schemes and this logo is not used, or commonly misused. However, we see the logo on packs in the UK that are also sold in other European countries, such as Ireland for example, where there is only one recovery scheme. Where there is not enough space to include the ingredients list or warnings and instructions for safe use, the manufacturer includes that information somewhere else in the packaging, on a leaflet for example. The “Hand & Book” symbol shows that information is included elsewhere in the packaging. All labelling needs to be easily legible and clear. The ingredients list must be in a language well-suited to the consumer. This ingredients list should be on the packaging or directly on the product’s container. If this isn’t possible, such an ingredients list can be included on enclosed cards, tags, or labels. All other information included on the product should be in English as well as other languages. The manufacturer or supplier’s name, batch code and contact information plus the Best Before date should be included on the product container and its packaging. If the cosmetics item is small in size, it is appropriate for the batch code to be printed only on the packaging. Customers should be referred to other information on the container, packaging, or enclosed items.